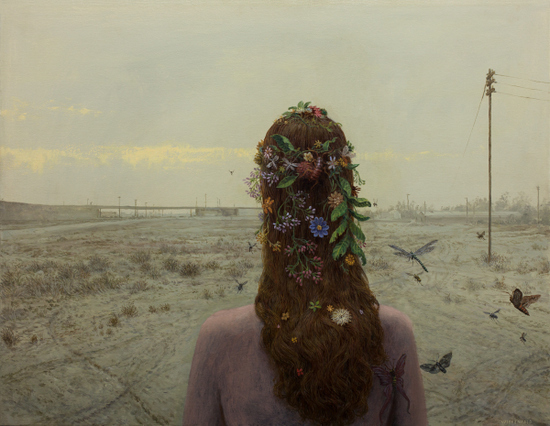 Aron Wiesenfeld's new show at Arcadia Contemporary, "Solstice," is both dazzling and disarming. 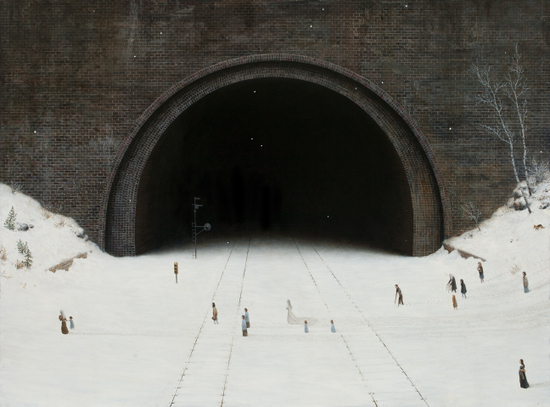 Wiesenfeld has a feeling for solitude and the figures in his recent paintings inhabit vast, enveloping spaces that poeticize their otherness by suggesting open-ended narrative possibilities. 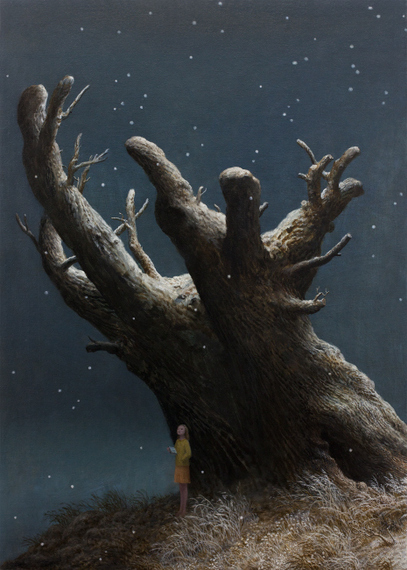 I recently interviewed Aron Wiesenfeld to ask him about his background, his ideas and his current work. "Bride" 2014, oil on canvas, 26 x 39.5 inches How did your early life prepare you to be an artist? I had huge support from my family for anything artistic and musical. My grandmother was an artist, she mostly painted with watercolors. I remember her telling me that kids' drawings were always better than grown-ups', which was very encouraging. I could draw anything and could always expect her to say "That's wonderful!" She made etchings with my brother and I, and showed us how to use watercolors and oil paint. My mom was also supportive of our artistic endeavors. She taped up all our drawings on the walls, the kitchen and dining room were literally covered with our drawings. We also had some prints in the house by artists like Rembrandt, Dürer and Sorolla, and I think I was lucky just to know what great art looked like, though when I got into comic books at about age 10, that was the only kind of art I was interested in. I also remember building things a lot, very ambitious projects like a three-story fort with a deck in the backyard. I think my work process now is like building -- the joy of it is in seeing it grow and what it will become. "God of the Forest" 2014, oil on canvas, 39 x 28 inches Initially, you worked on illustrating comics: what did you learn from that experience? 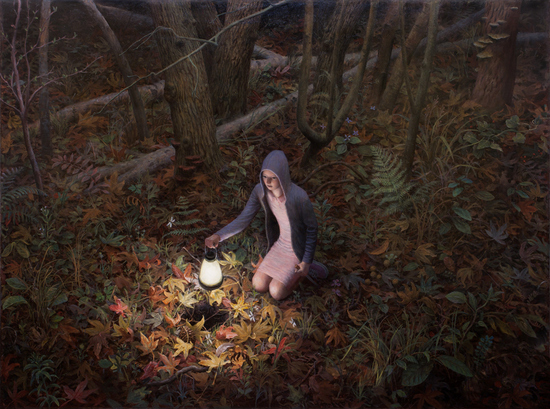 "October" 2014, oil on canvas, 23 x 35 inches How did your studies at Art Center in Pasadena shape you and your art? 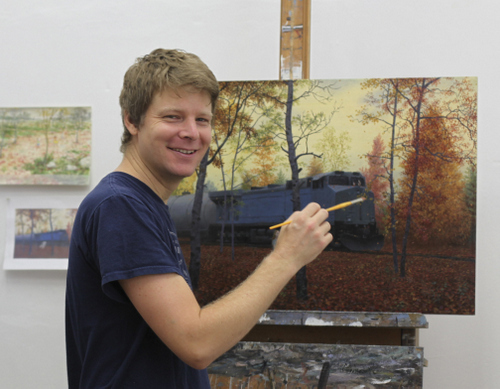 At Art Center I learned to paint from life by doing endless studies in oil and acrylic. The later part of my time there was mostly spent on larger paintings in the studio. Probably the most important thing I got from art school was learning to think about images differently. I had a lot of great teachers, but F. Scott Hess (who is now a Huffington Post blogger) was of particular help in that regard. We had many conversations about how a painting should stay with a person, or continue to reveal itself over time. It was a turning point for me. I began to think of paintings as an expression of the unconscious, or that they can be objects of meditation, speculation and much more. It's the exact opposite of the purpose of images in comics, which need to convey something very obviously. 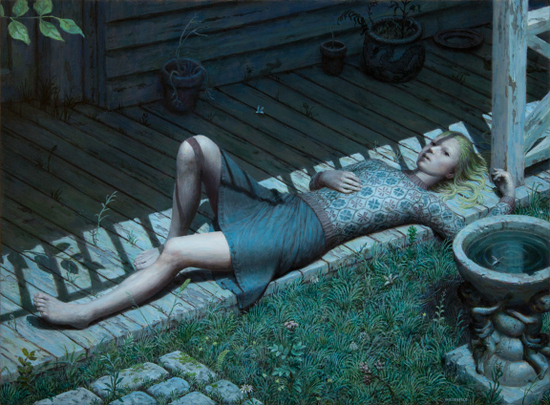 "The Garden" 2012, oil on canvas, 36 x 30 inches Your works often have a wistful tone. Tell me about the emotions you are trying to work with. I always felt somewhat estranged, particularly in social situations. It's become a theme in the paintings, but it's by no means only negative. I love the idea of being in-between places, creating a path of one's own. Solitude has always been synonymous with freedom to me, which meant being able to make my own choices, explore and take risks. That freedom is something I've had to fight for at times, and that is in the paintings too. "The Wedding Party" 2011, oil on canvas, 70 x 95 inches Is it fair to say that there are "Kitsch" and "illustrative" elements in your art? I admit my work does sometimes stray into the melodramatic, but it's not Kitsch, as I understand the word. My intention is to express what I feel, or surprise myself, and paint for my own enjoyment, with the secondary hope that it will communicate something of value to others. I'm not trying to push emotional buttons, or fashion something to have the broadest possible appeal. The Illustrative aspect is definitely there, though I think the same could be said of any painting that is not abstract. Labels are convenient, but art is very hard to put art into words, especially single words. They lead to a lot of pre-judgements and entrenched positions for or against certain "types" of art. I love Ray Charles's purely subjective take on the subject of music: "There are only two kinds of music: good and bad." 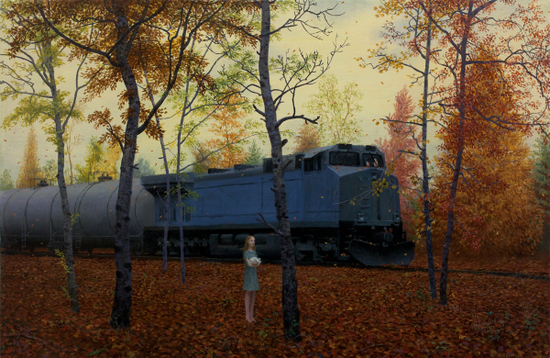 "Homecoming" 2014, oil on canvas, 26.5 x 34 inches Can you describe one of the works from your current show for me? 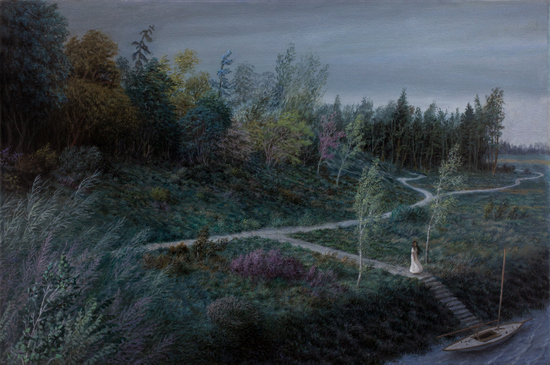 There is a medium sized painting called "Homecoming" of a woman facing away, looking toward a distant freeway overpass. She is undressed. In her hair are various flowers and plants arranged in a perhaps ceremonial way. There are also insects in her hair; moths and other winged bugs follow behind and around her. The setting is a neglected, tire-scarred area on the outskirts of a city, which can be seen near the horizon. The overall color is murky yellow, with light coming through the haze of the sky in a horizontal stripe. 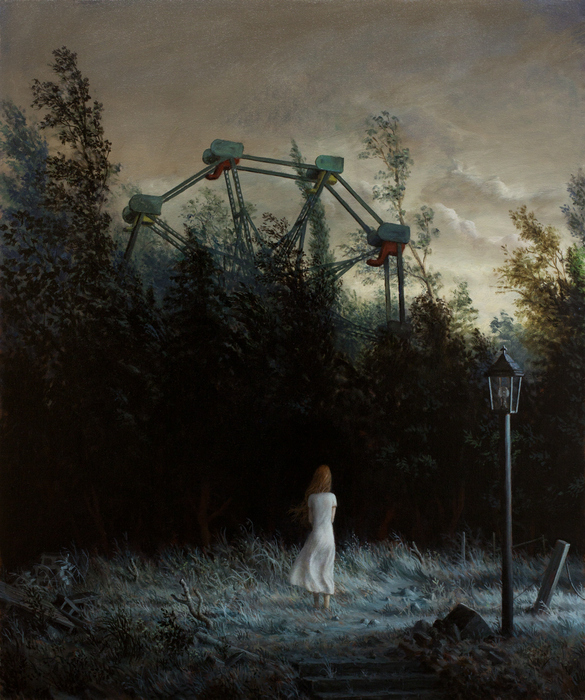 "The Well" 2011, oil on canvas, 67 x 83 inches Tell me a bit about the technical aspects of your work. I do a lot of quick sketches when I have ideas, and those are usually the basis for the paintings. I paint on unstretched canvas, so the dimensions can be altered at any point. As far as paint application, I use the same techniques that have been around for centuries; starting with a monochromatic underpainting to establish the main forms and the light, then adding color in thin layers when it's dry. It's a matter of building and refining over weeks until it's finished. It's rarely a straight path, I usually change my mind about things, paint over them, add things or just start over. I use a limited color palette of white, black, yellow ochre, Indian red and cobalt blue. "Winter Cabin" 2012, oil on canvas, 30 x 41 inches Who are some artists that you admire? Whistler, Corot, Titian, Bruegel, Caspar David Friedrich, Arnold Bocklin, August Sander, Balthus, Neo Rauch, Edward Hopper, Goya, Chester Arnold, Puvis de Chevannes, Carol Weight, El Greco and many others. Reading, spending time with my family, hiking, playing and listening to music.